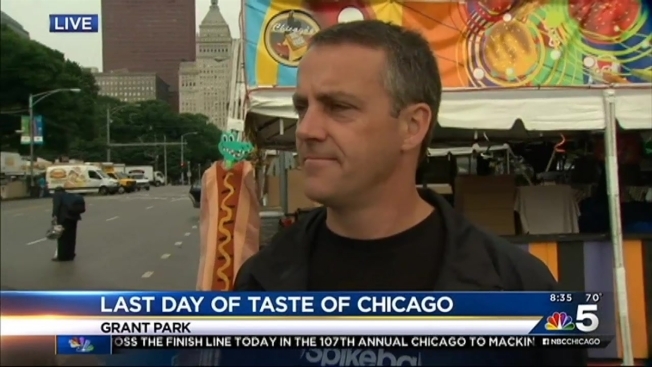 An estimated 1.4 million people attended the 35th Annual Taste of Chicago last week in the city’s Grant Park, city officials announced Monday. The attendance was up from the 1.1 million festivalgoers in 2014, when stormy weather washed out one day of the event, but down from the 1.5 million who attended the event in 2013. Officials credited sold-out musical performances at the Petrillo Music Shell, gourmet dinners at the Pure Leaf Celebrity Chef du Jour pavilion, cooking demonstrations at In the Kitchen with Mariano’s and the food for Thought podcast tent for this year’s attendance. The five-day fest, which ended Sunday, featured headlining acts like Weezer, Erykah Badu, The Chieftains, Spoon and Maze. Among the thousands of food items sold at this year’s event, officials noted that more than 17,000 empanadas were sold by Beat Kitchen, more than 31,000 mini donuts were sold at Beavers Coffee + Donuts, Billy Goat Tavern sold 15,000 cheeseborgers, and Carbon Live Fire sold 71,000 tacos. Nearly 37,000 slices of cheesecake were sold by popular fest vendor Eli's Cheesecake Co.
Last year, the annual food festival lost $169,404, but in 2013 it turned a $272,000 profit. In 2012, the festival was reduced to five days from ten after six years of losses and bumped to mid-July from its previous time around the July 4th holiday. Also the number of participating restaurants was reduced. It was not immediately clear if the city profited from this year’s event.